gives out available options for listing PCI devices. shows up both textual and numeric ID's. For the same purposes in Windows there is a nice program devcon.exe - it can be downloaded from http://support.microsoft.com/kb/311272. Sometimes it's necessary to add a download link to a file related to a post or embed a doc in. The simplest way would be to store files in a place like web-site directory which usually comes with Internet connection from ISPs (Internet Service Provider), but my ISP gives out only 10 MB for that purpose what is not too much. I checked out some of web file storage hosts and found that most of them have serious limitations. All those for free of charge would be nice too. ADrive - with the free basic subscription stored files are kept forever but public sharing (links to the files) expires in one month. This limitation was not very clear from their description of service, only when I made a file shared it showed such a notification. Also a share link from public domain leads to a page with "Download" button but not to the file itself, so embedding is not possible. MediaFire is pretty similar to ADrive besides there is no limitation in time for sharing link. A sharing link leads to a "Download" page - same as ADrive, their "Download" page shots out a pop-up every time you're there. FileFront is another one of the same kind, but its target group is gaming audience. Those sites represent the same approach for free file storage. As declared these services really work for those who wants just to transfer files to others or to store personal files, but unfortunately it is not possible to get direct link to stored files. HotlinkFiles was recommended by some people and as the site name suggests it supports direct links. The site has been giving out "too many connections" error for pretty long time, now its response is more informative: they claim been "under attack from malicious hackers that have managed to destroy a large portion of user database". That sounds sad and reveals the danger of storing your info in one place - let's wish them good luck to recover quickly from the disaster. It seems that a real solution for file-hosting comes from web-hosting services, so I ended up with Google Sites. It's appeared to be a well working variant and I don't see any drawbacks so far. 10 GB of storage per account, direct sharing links, etc. - you can check the list of features. Thanks to the visitor suggested SigMirror.com - with free account you can get there 2.5GB of storage space with 7GB bandwidth. MyDataNest seems to be an interesting file hosting site. Basic free account gets 2GB of storage and 20 GB of monthly transfer. 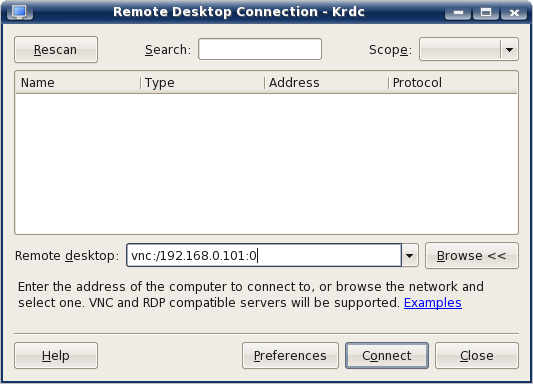 Having some computers with Windows and others with Linux makes remote desktop access from one computer to another slightly more complicated. Here is what I found as a working solution. From Windows to Windows connection - UltraVNC. It has viewer and server, 32 and 64-bit XP and Vista compatible. It works fine with hardware and virtual Windows machines and any edition (Microsoft remote desktop is not available for the cheapest versions as Home, Basic, Premium). From Windows and Linux to Linux - NoMachine NX. They offer Windows and Linux viewers for free, Linux server is free as well. I used NX viewers and servers on hardware and virtual Linux boxes with KDE, on Debian and Ubuntu all work very good. Recently the new SketchUp 7.1 was released. The most negative surprise from its free version is that import of 2D drawings in DWG and DXF standards has become impossible. Now this option is available in Pro version only. It seems Google feels that they have done something bad and to sweeten the pill a little bit they are offering optional temporary plug-ins: one for Windows and another for Mac... But it can not last forever and with the next version most likely the option will be gone completely. One of possibilities is to keep an old working Sketchup version around. It can be kept on a hardware computer or on a virtual one. The former costs more as Hardware + MS license, but it should be fine if there is one extra Windows box around , the latter - is just for MS license (I don't know the deal with Mac). It's a pity there is no Sketchup for Linux, so the only option is to run it under Linux with WINE - some people say that it works. Use another program to import DWG and DFX and then convert it into SketchUp file. I know one such program - Alibre. Alibre is a true dimension/parameter driven 3D mechanical development tool (SketchUp as we know is not) and there is a free Xpress version offered. The free version has some limitations as 5 unique parts in assembly, for example, but it still enough for a small project. I actually prefer to use Alibre for part and assembly development and then if needed I export design to SketchUp format. For the exporting there is a plug-in for Alibre called Alibre3DPublisherForGoogleSketchUp.exe. The bad news is that Alibre stopped providing the plug-in for download from its site officially and seems they do not want to support this option in the future, but it is still available from Alibre FTP libraries: http://www.alibre.com/alibrelibraries/ftp/addons/Alibre3DPublisherForGoogleSketchUp.exe; the good one is that the plug-in is still working fine with the new 12.0 version of Alibre. This week Comodo stepped on a rake. They released a new virus database and cmdagent.exe service went completely crazy: it took about 100% of CPU time and made computers totally useless. then update the database again to the corrected new version. Not all Linux distributions are ready for C and C++ compilation right after installation. Some of them are missing compilers, others - some basic libraries. I decided to write the note how to make it working. I'd like to put in the list some useful commands for finding things in Linux environment. apropos will work only if manuals are installed - usually they are, but sometimes for the sake of resource saving manuals can be omitted. The first line of the test file. There are some variations of grep as fgrep, rgrep, egrep, bzgrep, etc. - check it with "apropos grep". kfind is a GUI version of find with grep - it can search for files and pattern inside files.